In her more than two terms as a U.S. senator representing Minnesota, Amy Klobuchar has built a reputation as an effective champion for consumer safety, sponsoring bills that improve swimming pool safety, ban lead in children's products and tackle the nation's opioid crisis. "Consumers deserve products that have been tested and meet strong health and safety standards," her website declares. During her time in the Senate, Klobuchar has advanced proposals championed by the medical device industry that some consumer advocates claim would put patients' safety at risk, a review of her record by The Associated Press and the International Consortium of Investigative Journalists found. Safety and regulatory concerns relating to medical devices have come under scrutiny since the AP, ICIJ and other media partners began publishing a series of investigative stories about the industry in late 2018. While many of her Democratic presidential rivals promote ambitious proposals for free health care and college tuition, Klobuchar's work on medical devices is a window into her narrower, often more moderate policy portfolio. Klobuchar defends her record on regulating medical devices, telling the AP in a statement, "Patient and consumer rights have always been a major focus of mine." "The legislation to improve the process was passed as part of a larger package of reforms, signed into law by President Obama, in response to slow-downs and workforce shortages at the FDA," Klobuchar said. "The legislation also included more funding for the FDA to hire medical experts to examine the safety of products that came before them for approval. The final legislation was supported by numerous patient safety groups." 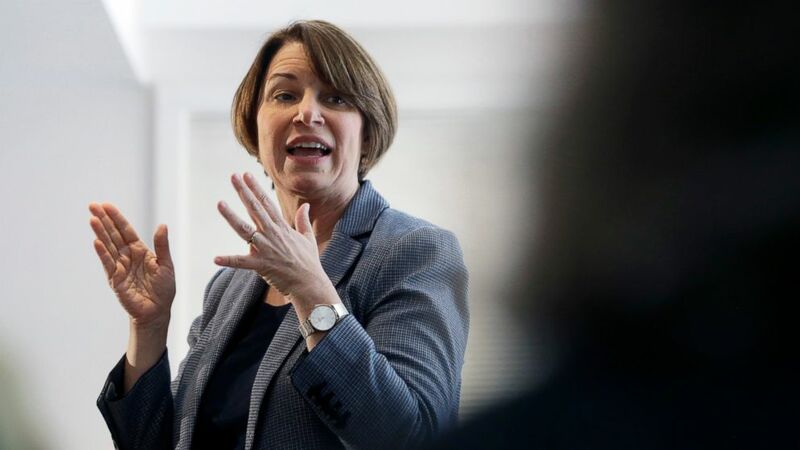 Diana Zuckerman, president of the nonpartisan National Center for Health Research think tank, said that Klobuchar's legislative record has put the demands of the device industry above patient safety. It has also provided political cover that makes it easier for other progressive lawmakers to embrace pro-industry measures, Zuckerman said. "When a liberal Democrat actively champions a position that harms patients, as Sen. Klobuchar has done on FDA legislation, it helps to persuade other liberal Democrats," Zuckerman said. "There was a great deal of concern about making sure that American consumers were getting cutting-edge medical devices as soon or sooner than anyone else in the world, but also concern about ensuring the safety of those products," Hamburg said. "She was an advocate and supportive of a number of things that we were doing and she held our feet to the fire to make sure we were keeping our promises." She's obligated to support "job makers," said Larry Jacobs, a political scientist at the University of Minnesota. "Every presidential candidate is going to have issues that put them in sticky spots between the national political centers of the party and their constituents back home," he said. "I think Sen. Klobuchar has been a very good representative of the state and a leader in Congress in being able to facilitate important conversations around medical devices," said Shaye Mandle, chief executive and president of the Medical Alley Association, which represents device makers and other health care businesses in Minnesota. "Most states don't have a medical device industry — every state has millions of patients that rely on medical technology." Medical devices provide clear benefits to millions of people, but a yearlong investigation by ICIJ, the AP and media partners in 36 countries has called into question whether the device industry has put patients in harm's way by rushing poorly tested products to market. Governments around the world, including the United States, hold even complex implants to a lower safety testing standard than most new drugs. Minnesota is widely seen as the capital of the U.S. device industry. Medtronic, the world's largest medical device company, has its operational headquarters in Minneapolis. Klobuchar has developed relationships with the company's leadership — even inviting Medtronic's then-chief executive to be her guest at Obama's State of the Union address in 2011. Hundreds of other device makers have offices in Minnesota and the industry employs nearly 30,000 people in the state. As a result, Democratic and Republican lawmakers from Minnesota have traditionally supported the industry's interests. Erik Paulsen, a Republican House member who was defeated in November, received more financial support from the device industry over the past 10 years than any other member of Congress. Over the past 10 years, Klobuchar's Senate campaigns have received more than $300,000 from the device industry, including corporations, unions, political action committees and individuals, according to the Center for Responsive Politics. Among Democrats, only Casey received more money from the device industry during the period. "Medtronic has engaged with Senator Klobuchar on a range of policy issues over the years," Medtronic said in its statement. "She listens to our positions as one of her constituents, advocates for them when she agrees, and doesn't when she disagrees." There have been times when Klobuchar has spoken out against the industry. In 2016, after the Minneapolis Star Tribune revealed that Medtronic failed to disclose more than 1,000 reports of "adverse events" relating to its Infuse Bone Graft device, Klobuchar wrote Medtronic asking why the company didn't report the information sooner. After the newspaper reported more details about Infuse device problems last year, Klobuchar and fellow Minnesota Sen. Tina Smith wrote Medtronic about the company's "failure to quickly and accurately report data to the FDA." In 2010, halfway through Klobuchar's first Senate term, the device industry became alarmed about a looming report that it feared would lead to heightened regulation — and a slower, and more expensive, path to get new products to market. The process allows companies to get approval for new devices based on "substantial equivalence" to previously approved products. It's how the vast majority of new medical devices are approved for the American public. Already worried about a backlog in approvals, a prominent device trade group and its allies in Washington began pressing the FDA to ignore the Institute of Medicine's findings even before the institute finished its review. In a May 2010 letter, Klobuchar and Paulsen said they were concerned with the review and called for the FDA "to reject proposals that unduly burden small businesses and suppress the development of promising medical breakthroughs." The consumer advocacy group Public Citizen denounced the bill, writing to Klobuchar that it would "weaken the already inadequate regulatory requirements for medical devices" and "would undoubtedly accelerate the rate of patient casualties." The bill never left the Senate, but some key provisions that required the FDA to take a lighter approach with industry during device approvals and language that eased conflict of interest rules at the agency were ultimately included in the Senate's version of the landmark Food and Drug Administration Safety and Innovation Act, according to a press release from Klobuchar's office. The senator characterized the changes as "common-sense reforms" that would give patients access to vital devices. Obama signed the legislation into law in 2012. In 2016, Klobuchar introduced another bill aimed at easing device regulation. The Improving Medical Device Innovation Act would have required the FDA to explore alternatives for some device types to existing reporting requirements for patient injuries and device malfunctions "that will be least burdensome for device manufacturers." These reports are a primary way the FDA learns about dangerous devices once they are already on the market. The bill also contained a provision to give device companies a voice in recommending which experts the FDA includes on panels reviewing their devices. "This is really noxious," said Dr. Peter Lurie, who held senior posts at the FDA from 2009 to 2017 and now heads the nonprofit watchdog group, the Center for Science in the Public Interest. "The last thing the agency needs is a bunch of self-interested input from sponsoring companies." The Senate bill was never voted on but the provision regarding FDA expert panels lived on. In late 2016, Klobuchar joined an overwhelming majority of legislators to approve the 21st Century Cures Act. Signed into law by Obama, the measure seeks to accelerate product development for drugs and devices and strengthens the requirement that the FDA emphasize the "least burdensome means" for reviewing medical devices.